The Anna Plowden Trust scholarship allowed me to continue into the second year of my Masters course. The second year began after a 16-week work placement in Munich, which provided me with experience to begin the second year of my course. The year has been challenging and exciting, with modules in Cultural Heritage Management, Historic Interiors and research as well as sessions where we practised our skills with stained glass cutting, leading and painting. 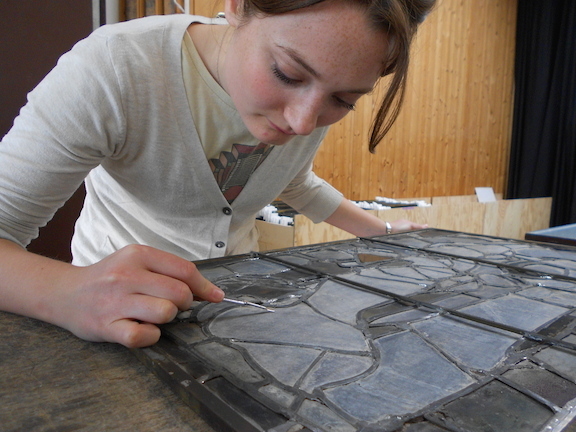 During the Spring I conserved a Victorian panel - a task I thoroughly enjoyed as it gave me the chance to put together all the skills I have been learning through the course. I relished the chance to be 'in charge' of my own conservation project and to be able to experiment with creating glass-painted infills to suit modern conservation ethics, which are my particular interest. During the Stained Glass Masterclass in February I learned from the experience of graduates on the course; this broadened my knowledge and also encouraged me to network with other students and professionals. My dissertation focuses on a window of All Saints Church in York; it is incredibly satisfying to be able to use all the research, theoretical and academic skills I have learned over past two years. At the same time, I am working for two days a week at the York Glaziers Trust, where I am helping to fit protective glazing to the Great East Window. In the autumn of 2015 I am looking forward to a nine-week placement at Barley Studio in York. The past year has really developed my confidence and I am very eager to continue my training and put my skills into practice. I am excited by what the future holds in my career and am very grateful to the Anna Plowden Trust for their financial support which has helped me reach this stage.